Approaching Montone fron the South,Approaching Montone fron the South, the might walls are breached by the arch of the Verziere gate which draws itname from the main activity of the town’s ancient inhabitants: the growing of vegetables (“Verzure”). Through this gate passed the only road wide enough to accomodate carts baring produce from the surrounding countryside. At the top ofthe incline just before the second archway stood the checkpoint where soldiers checked the papers of those wishing to enter. Through the secon arch one enters the village into main street which leads up to the square. 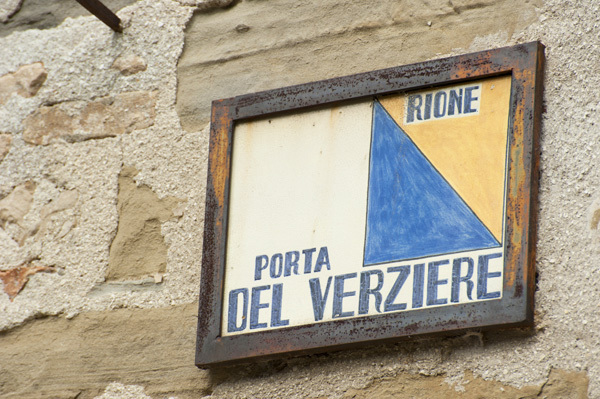 This quarter, whose colours are blue and yellow, is laced with hidden, winding alleys and steep stairways like the “Scalacce” or “ Dreaded Stairway”, a steep stairway of 79 steps hidden away in an unit area between the houses. It also has ample terraces on the village walls with stunning views over the countryside. 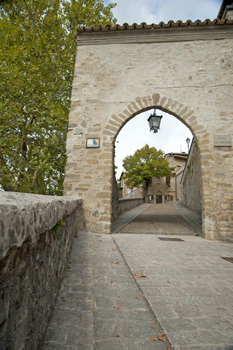 the might walls are breached by the arch of the Verziere gate which draws itname from the main activity of the town’s ancient inhabitants: the growing of vegetables (“Verzure”). Through this gate passed the only road wide enough to accommodate carts baring produce from the surrounding countryside. At the top ofthe incline just before the second archway stood the checkpoint where soldiers checked the papers of those wishing to enter. Through the secon arch one enters the village into main street which leads up to the square. This quarter, whose colors are blue and yellow, is laced with hidden, winding alleys and steep stairways like the “Scalacce” or “ Dreaded Stairway”, a steep stairway of 79 steps hidden away in an unit area between the houses. It also has ample terraces on the village walls with stunning views over the countryside.